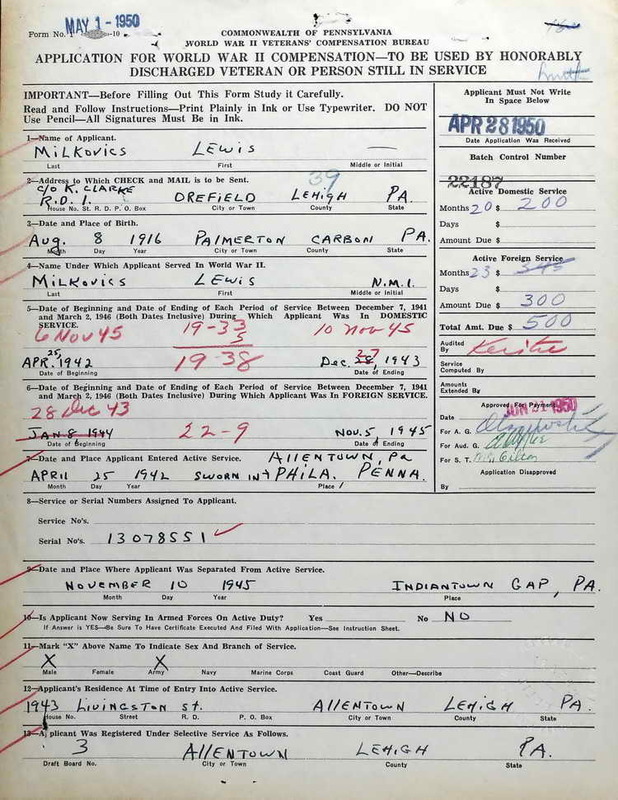 WWII Pennsylvania Veterans Bonus application submitted by Lewis on 4 February 1950. He was credited with 20 months of domestic service and 23 months of foreign duty. He was awarded the full $500 bonus available. Lewis Milkovics, 82, Clermont, Fla., formerly of Allentown, died Sunday, Dec. 6, in South Lake Memorial Hospital, Clermont [FL]. He was the husband of Louise (Wiechman) Milkovics. They were married for 55 years in June. From 1953-71, he was meat and perishables associate editor of Progressive Grocer Magazine, New York City, and architect of the meat book, "Profitable Meat Merchandising." After that he was a self-employed business and meat consultant for 10 years until retiring in 1981. 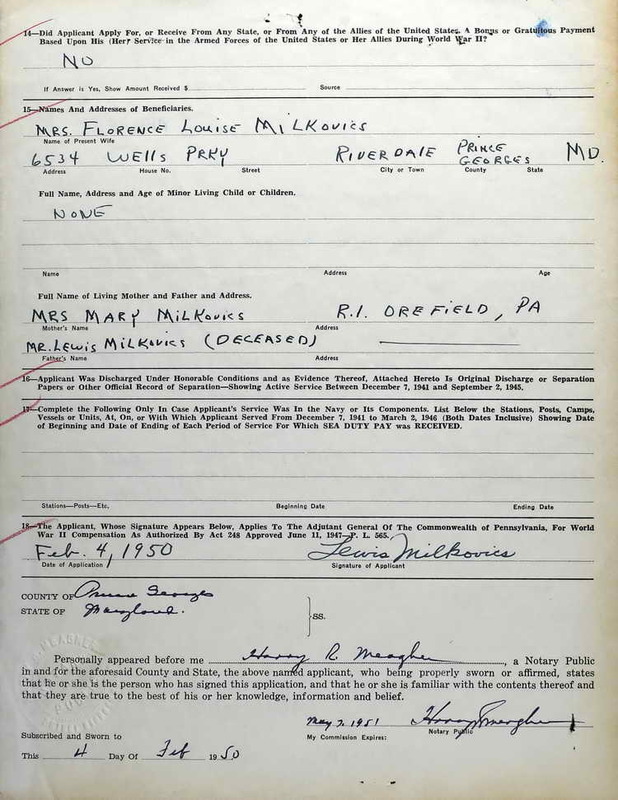 He graduated from the University of Maryland in 1950. 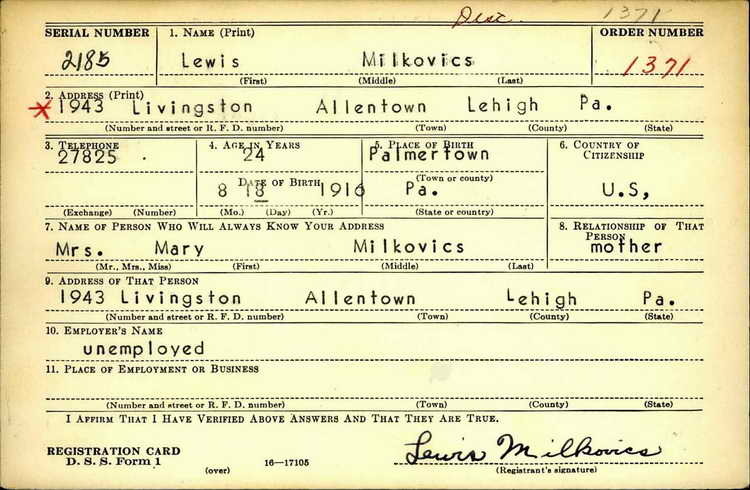 Born in Palmerton [PA], he was a son of the late Lewis and Mary (Lockner) Milkovics. He was an Army veteran of World War II, serving with the 508 Parachute Regiment 82nd Airborne Division. In 1993, he compiled and edited the book, "The Devils Have Landed, World War II." He was a member of Gen. Eisenhower's Honor Guard and recipient of the Purple Heart. Survivors: Wife and a sister, Margaret Magyar of Allentown. Services: At convenience of the family. Arrangements, Becker Funeral Homes, 806 W. Mineola Ave., Clermont.